Affiliate marketing is just a awesome way to earn money online, one of the most popular source to earn BIG bucks for bloggers, because many bloggers earning handsome income from blogging, there are many ways to promote affiliate products here I will discuss all about them but especially this blog post dedicated to Affiliate marketing in India dedicated to these three BIG players of Indian e-commerce market, as you know these companies are making sells in billions if you can send traffic to them through your links then you can earn commission up to 20% and that's not bad, let me tell you a small example of it. Actually, I have been involved in making money online and blogging, that's why I always do little bit experiment to find out the new way to promote brand, getting traffic and of course to earn money legit way, the story I am going to share with you, this is one of my experiment, actually by education I am a Mechanical Engineer and I have very good knowledge in it that's why even I Become Topper Many Times in College After Failing Twice. Okay, here is the interesting story, actually I have been using Facebook from last seven years, after knowing about affiliate marketing concept I have implement with my Facebook profile, actually here is affiliate concept, see in affiliate marketing you will get a unique URL which you need to shared if any one will buy product through that link you will earn commission, if you are not getting this concept then you will understand with it after seeing the example, actually as I have already share with you by Education I am a Mechanical Engineer and many of my Facebook friends are preparing for government jobs, that means if I will share a very good book in Mechanical Engineering for preparation including my affiliate link it will make me money, because I bought that book and I am sure my friends definitely going to buy that book and it happens they are still buying it and I am making commission from it and of course they are getting awesome benefit from it, you can do the same to earn commission but always share product about it you are known or it is always share a product which product you have already used. Well, as stated on the title in this blog post, I am going to share with you Flipkart Vs SnapDeal Vs Amazon, that's why you can with the best one. Flipkart is one of the famous e-commerce choice for Indian consumers even you know about Flipkart, but yes whenever we wanted to buy a product then most of the time we do check its cost on other websites also those are also popular in India. Well, here I am sharing with you my experience with Flipkart as an affiliate, see I have been using Flipkart affiliate program from last two years but I did not take this as a serious earning source for me, because I have many other sources of earning but its okay, with very less effort if you are earning then its good. 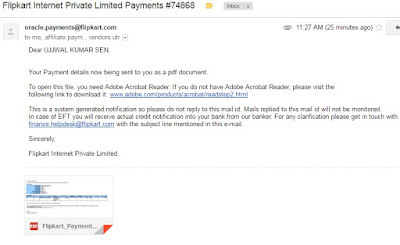 My affiliate earning is not that much but yes I have earn some amount and I have proof of it also, my first payment from Flipkart was 455 INR but later I have changed my mode of payment to bank transfer there is a strong reason behind of this and you must know about it, otherwise the same incident may also happened to you and as a reader of "BloggerHowtoSEOTips", I don't want that. 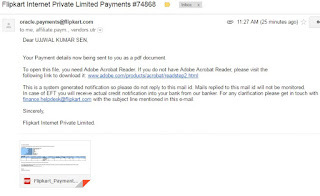 Actually, as I already told you that I was not that much interested to earn money from Flipkart as an affiliate because of low affiliate commission. Well, as I have already told you I got paid from Flipkart in terms of EGV amount was 455 INR only, okay there was nothing problem, problem started with one, when I came to know about it I tried to use it, I bought a watch and I was accepting to receive my bought product, but I could not receive it, I have contact Flipkart support team, because I bought watch from EVG, that's why I wanted to know about it and I got replied from Flipkart team that the product has been cancelled and I will get back my payment soon may be after seven days, so I received paid amount through Debit card within 48 hours but EVG I did not check. The real SAD story is here, just after couple of days I wanted to buy another product, when I choose payment mode EVG and I have put their code for EVG and seen that there is only 155 INR left for this matter I talk to Flipkart customer support they replied to me that its been used and I talk to them who but they told me, they can not shared with me so I this way I lost my money, but I am sharing with you that's why the same story will not repeat with you another thing I have read in Flipkart that Flipkart is not responsible for used of EVG. So, I will recommend change your payment mode to bank transfer, that is also known as EFT, the full form of EFT is Electronic Fund Transfer, but minimum threshold for withdrawing payment is 1000 INR. SnapDeal is an old player in affiliate marketing, probably SnapDeal marketing team understood the potential affiliate marketing and once anything come in attention in the blog-o-sphere then it becomes more famous especially in India, this is a recent trends of digital India. Well, after knowing that SnapDeal also offering affiliate products means if anybody buys any product through your link then you will get commission, actually everything first I checked myself then I go for promoting the product, so here is story begin. Actually, I wanted to buy shoes, so I have started searching about it actually last time I got shoes of Adidas, I wanted to joy the test of another one, so I have tried other brands after searching and seeing many shoes I have decided to buy Puma Black Tazon DP, I have checked price of SnapDeal, there is a vendor who is offering 40% off on the same shoes later many e-commerce sites started offering 50% off on the same shoes, but at that time only SnapDeal vendor offering 40% off, so after looking at the product I have ordered it, the product was good. As I shared with that, I don't promote these products the most, but yes I do promote products those are most useful for my Facebook friends and I make little commission from my Facebook profile, but most of the product I have promoted of Flipkart product, yes I have promoted few products of Amazon also. Here is the story of promoting affiliate products of Amazon, after launching Amazon.in, its popularity has been increased in India, actually one of my colleague wanted to buy few books of IIT JEE for his nephew, then we search on e-commerce websites like Flipkart, SnapDeal, ShopClues, PayTm and others also. But, we could not find out those books on these websites, so I told him to go to Amazon.in, he told me that you please ordered book and ask me for payment, if you will find out. After searching on Amazon, I found it and ordered book and I have seen that I got commission for selling those books through my link. I do have experience for this condition, that's why I am sharing you, because may be you don't know it or may be you have seen such things but you unable to understand it. Actually, its long time back I have seen someone bought the product through my affiliate link and after few days my commission has been disappeared I could not understand about it, I did contact affiliate support but I did not because I was busy and the commission was too small. But, here the story begin, one of my friend wanted to buy shoes, he told me that he wanted to buy a shoes and he used my affiliate link to buy Reebook shoes and after buying I got handsome commission because it was costly. But, after receiving shoes from courier he was not happy, because he told me that he did not get the product as he invested money, so he wants to replaced the product, then I click on cancel button and after clicking their my commission was removed from my affiliate account. Even we did not replaced the product, but I did not back affiliate commission, that means once product will be cancelled from the buyer whether he or she will replaced it or not you will loose your affiliate commission. Well, it is a very good for all Indian bloggers that we are getting many opportunities to earn money from blogging, actually couple of years back we did not have such ways to earn money, but now a days its a great source for us. There are two ways to promote your affiliate links one is free and another one is promoting product through ads, you can get help from ads networks but don't promote any product through ads network until or unless you don't have experience in it. These days people are living on social medias more and more even its popularity and density of people increasing day by day, that means as an affiliate marketer, at least as a beginner affiliate marketers. Well, as I have shared with you, how I got sells through Facebook and earn commission like the same you can do. Other than Facebook, there are many other social networks where you can promote affiliate products and earn commission but for making it easier or making it effective first you have to have more friends and more important those trust on you and know you. This is really important to get sells and which make you commission, that means you must not promote any product which is not good and which is not suitable for your social friends circle. Well, here are others networks those are helpful for getting sells like Twitter, LinkedIn, Pintetrest- these are most popular networks in India so if you are targeting Indian traffic then these medias are just perfect for making your product reach more wider. These three sources are most popular way to promote and get sells, okay let me tell you about it details, see you have to post affiliate links on your wall then those are your friends they will see your post but let me tell you another working trick, just after adding the link click on like it will increase reach, if possible ask others to like and see the post about. But, if others will see the post will not help you to get commission rather if people will buy the product then you will make commission. The same concept you have to apply while sharing the link on groups and pages of Facebook but don't spam share links those are relevant to Group people, I mean if a group about SSC Preparation then share there products related to SSC Preparation like any book, aptitude test book, previous year question paper. I think you have e-mail address and you must have contacts those sent you e-mail just do one thing send them e-mail about the product in which they can be interested the most. Here you have to apply a little tricky concept which helps to earn more commission, see the concept is simple, if you are sending an e-mail to a student then you must send affiliate links related to career, which brings more sells and one more thing which will create to get win-win situation means your contact will get very good useful product and you will earn commission. May be you are using apps, i am talking about messaging apps like Whatsapp, Hike, We chat,if you are using these apps then you have huge potential to increase your affiliate link reach but think is that if you have contact those are familiar with e-commerce website then you have great opportunity to earn commission while doing almost nothing, just you need to send then them affiliate link, but you must send them link those are most interesting product for them, that's why conversion rate will be more means more people will buy that product that means more money you are going to earn. Direct contacts means those are reaching you directly for buying any product online, the same thing happen with me many times and i have earn commission. You can do the same for earning extra commission and please inform them about it, it will help you to be honest for them also. I hope you got lot of important information from the above comparison that's why you can choose right affiliate one's, but one suggestion which I have been implementing myself, because it works, that's why I am sharing with you, see if you want to know the right choice for your blog then try one by one for a particular time and see which one is performing well. Then select one which is working great for you, I hope you are getting me. 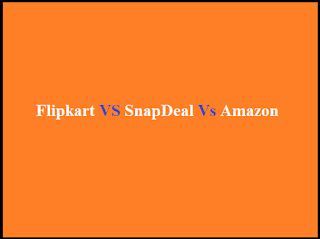 Is there anything you would like to know about Flipkart Vs SnapDeal Vs Amazon affiliate in India? Thanks for reading, if you want any other information then let me know. nice very nice keep it up bro.......i m new please add me on facebook and guide me to earn money online and blogging I m from Azamgarh U.P. Great happy blogging, if you need any help then let me know? I had just joined affiliation with snapdeal on early Oct 15. In November first week I wrote a mail to snapdeal affiliates about guidance and to,give contact details of their executive to,directly talk with us. I wonder, they had just disappeared my November 1st week approved commissions. What should,I do now..? I am,not getting any sales thru amazon. Very very less sales in flipkart thru app install. I promote thru adwords. For this I can not do anything directly, I will suggest you to contact them directly. it is important to upload pan card and address proof to get gift card from flipkart. Previously it was not but I don't know right now what they want?